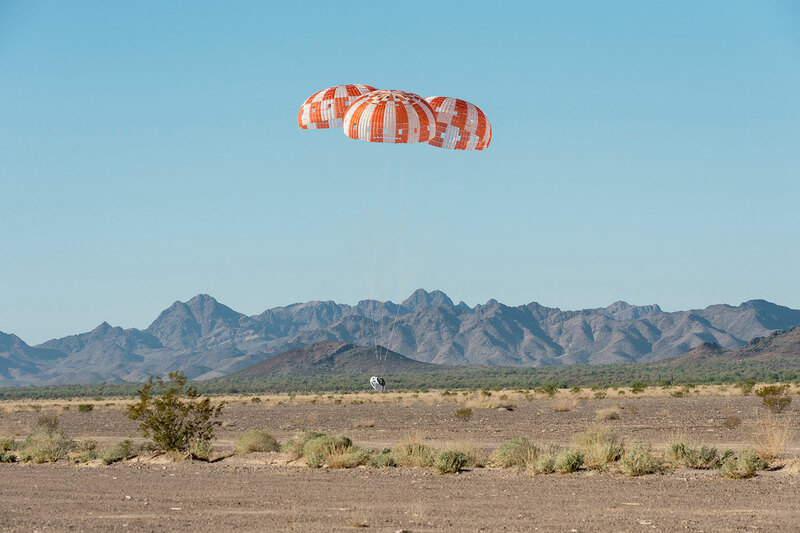 NASA tested the parachutes for the recovery system on its Orion crew exploration vehicle above the U.S. Army's Yuma Proving Grounds in Arizona on July 31. The test proved unsuccessful when a test set-up parachute failed. The failed parachute — called a programmer chute — deployed, but it did not inflate properly and failed to get the test article that simulated the Orion crew module into the correct orientation, altitude and speed for the test, causing the parachute system for the test vehicle to fail. "This is the most complicated parachute test NASA has run since the '60's," said Carol Evans, test manager for the parachute system at NASA's Johnson Space Center in Houston. "We are taking a close look at what caused the set-up chutes to malfunction. A failure of set-up parachutes is actually one of the most common occurrences in this sort of test." 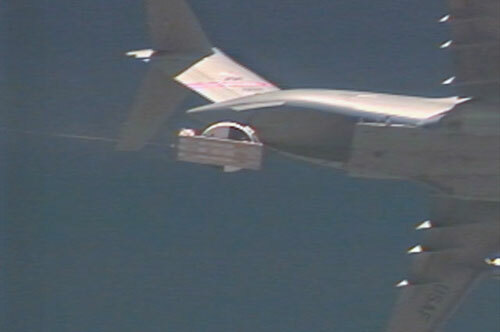 To test the first generation design of the recovery parachute system, a mock-up of the Orion crew module was dropped from a C-17 airplane at 25,000 feet altitude. In addition to the parachute system for the mock-up, the test requires 10 parachutes for preparation of the test. Some of these parachutes extract the mock-up from the airplane. Then pyrotechnics fire to separate the mock-up from the pallet on which it sits while inside the plane. As the mock-up is released from the pallet, a programmer chute and two stabilization chutes are released to set up the proper test condition. At a predetermined time, those chutes are released to start the test of the Orion parachute system. The remaining test preparation parachutes return the pallet to the ground. The Orion recovery parachute system is based on the parachute system used for the Apollo capsule and uses eight parachutes. There are three types of parachutes in the parachute assembly system: drogues that are designed to stabilize the spacecraft; pilots which pull out the main parachutes; and mains, which are the large parachutes that actually lower the spacecraft to the ground. The two drogue chutes are deployed to slow the mock-up and ensure it is pointing in the right direction. The drogue chutes are then cut away, and three pilot chutes are deployed and in turn each pull out one of the three main 116-feet-diameter parachutes that will slow the mock-up to a safe landing speed following a launch abort. The pallet has its own parachute recovery system. During the July 31 test, the programmer parachute and the two stabilization chutes released properly. 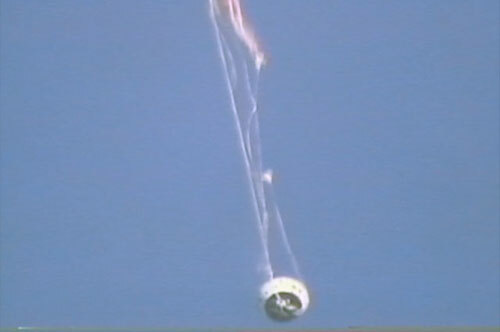 The programmer parachute did not inflate properly, and the stabilization parachutes inflated but did not stay inflated. As a result, the mock-up dropped faster than intended. When the test set-up chutes were released, the drogue chutes were immediately cut away, sending the mock-up into a free fall. During the free fall, the mock-up began to tumble, creating forces that pulled the main parachutes out. Two of the three main parachutes broke free. The third parachute held, but it was torn, too damaged to slow the falling mock-up. The result was a landing that severely damaged the test mock-up. In addition to testing the parachute system, one of the objectives of this test was to demonstrate the testing techniques. NASA engineers and managers are reviewing the test procedures and the test hardware and set-up, along with the video and photographs collected from the test, to determine what caused the programmer chute to fail. The Orion parachute test vehicle (PTV) is prepared for structural testing in the Structural Test Lab at NASA's Johnson Space Center. A test set-up parachute failed during the July 31, 2008, test of parachutes for the recovery system for the Orion Crew Exploration Vehicle. Shown here, the Orion mock-up, attached to a pallet, is pulled from its C-17 transport above the U.S. Army's Yuma Testing Grounds in Arizona. As the mock-up is released from the pallet, the programmer chute and two stabilization chutes are released to set up the proper test condition. The programmer chute — the chute that is supposed to get the Orion mock-up in the correct orientation, altitude and speed for the test — failed to inflate properly. The chute was one of 18 parachutes used during the test. Only one of the three main parachutes for the recovery system held to the mock-up during the July 31, 2008, test. The parachute was torn and too damaged to inflate properly and slow the falling mock-up. The mock-up used during the July 31, 2008, test of the parachute system for the recovery system of the Orion spacecraft was severely damaged when a test set-up chute failed to properly inflate and caused the parachute system to fail. The failed parachute —called a programmer chute — was supposed to get the test vehicle set up to the correct test conditions. A successful drop test using a test article simulating the capsule was conducted on Dec. 20, 2011. NASA successfully conducted a drop test of the Orion crew vehicle's parachutes high above the Arizona desert Tuesday, Dec. 20, in preparation for its orbital flight test in 2014. Orion will carry astronauts deeper into space than ever before, provide emergency abort capability, sustain the crew during space travel and ensure a safe re-entry and landing. A C-130 plane dropped the Orion test article from an altitude of 25,000 feet above the U.S. Army's Yuma Proving Grounds. Orion's drogue chutes were deployed between 15,000 and 20,000 feet, followed by the pilot parachutes, which then deployed two main landing parachutes. This particular drop test examined how Orion would land under two possible failure scenarios. Orion's parachutes are designed to open in stages, which is called reefing, to manage the stresses on the parachutes after they are deployed. The reefing stages allow the parachutes to sequentially open, first at 54 percent of the parachutes' full diameter, and then at 73 percent. This test examined how the parachutes would perform if the second part of the sequence was skipped. The second scenario was a failure to deploy one of Orion's three main parachutes, requiring the spacecraft to land with only two. Orion landed on the desert floor at a speed of almost 33 feet per second, which is the maximum designed touchdown speed of the spacecraft. Since 2007, the Orion program has conducted a vigorous parachute air and ground test program and provided the chutes for NASA's successful pad abort test in 2010. Lessons learned from this experience have improved Orion's parachute system. On Feb. 29, NASA successfully conducted another drop test of the Orion crew vehicle's entry, descent and landing parachutes high above the Arizona desert in preparation for the vehicle's orbital flight test in 2014. Orion will carry astronauts deeper into space than ever before, provide emergency abort capability, sustain the crew during space travel and ensure a safe re-entry and landing. An Air Force C-17 plane dropped a test version of Orion from an altitude of 25,000 feet above the U.S. Army's Yuma Proving Grounds in Arizona. Orion's drogue chutes were deployed between 15,000 and 20,000 feet, followed by the pilot parachutes, which deployed the main landing parachutes. Orion landed on the desert floor at a speed of almost 17 mph, well below the maximum designed touchdown speed of the spacecraft. The test examined how Orion's wake, the disturbance of the air flow behind the vehicle, would affect the performance of the parachute system. Parachutes perform optimally in smooth air that allows proper lift. A wake of choppy air can reduce parachute inflation. The test was the first to create a wake mimicking the full-size Orion vehicle and complete system. Since 2007, the Orion program has conducted a vigorous parachute air and ground test program and provided the chutes for NASA’s successful pad abort test in 2010. All of the tests build an understanding of the chutes’ technical performance for eventual human-rated certification. 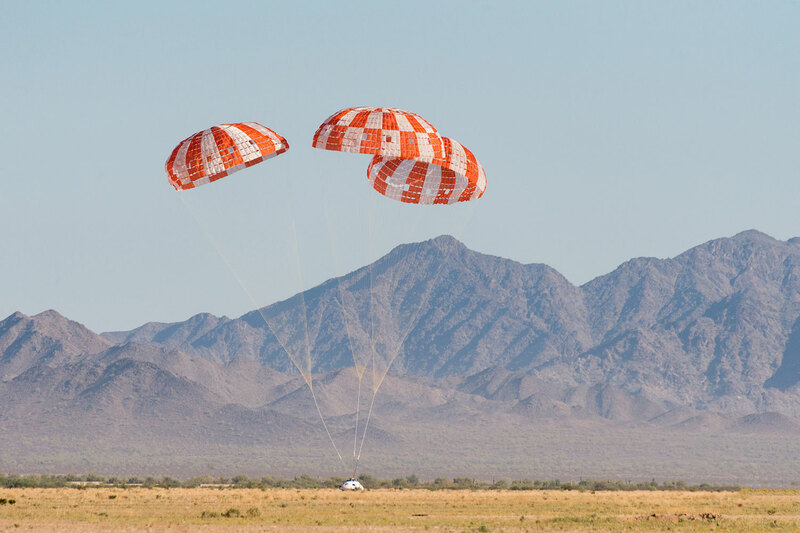 NASA completed another successful test Wednesday (July 18) of the Orion crew vehicle's parachutes high above the Arizona desert in preparation for the spacecraft’s orbital flight test in 2014. Orion will carry astronauts deeper into space than ever before, provide emergency abort capability, sustain the crew during space travel and ensure a safe re-entry and landing. A C-17 plane dropped a test version of the Orion from an altitude of 25,000 feet above the US Army Yuma Proving Ground in southwest Arizona. This test was the second to use an Orion craft that mimics the full size and shape of the spacecraft. 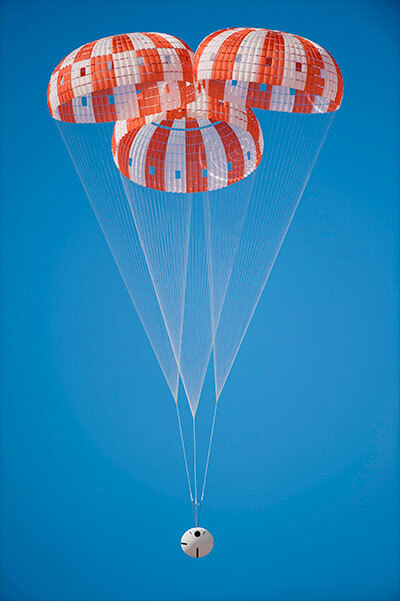 Orion's drogue chutes were deployed between 15,000 feet and 20,000 feet, followed by the pilot parachutes, which deployed the main landing parachutes. Orion descended about 25 feet per second, well below its maximum designed touchdown speed, when it landed on the desert floor. "Across the country, NASA and industry are moving forward on the most advanced spacecraft ever designed, conducting drop and splashdown tests, preparing ground systems, designing software and computers and paving the way for the future of exploration," William Gerstenmaier, associate administrator for the Human Exploration and Operations Mission Directorate, said. "Today's parachute test in Yuma is an important reminder of the progress being made on Orion and its ultimate mission — enabling NASA to meet the goal of sending humans to an asteroid and Mars." Orion parachutes have so-called reefing lines, which when cut by a pyrotechnic device, allow the parachute to open gradually, managing the initial amount of drag and force on the parachute. The main objective of the latest drop test was to determine how the entire system would respond if one of the reefing lines was cut prematurely, causing the three main parachutes to inflate too quickly. Since 2007, the Orion program has conducted a vigorous parachute air and ground test program and provided the chutes for NASA's successful pad abort test in 2010. All of the tests build an understanding of the chutes' technical performance for eventual human-rated certification. NASA Tuesday (Aug. 28) successfully completed another parachute test of its Orion spacecraft high above the skies of the U.S. Yuma Army Proving Ground in southwestern Arizona. The test examined the maximum pressure Orion's parachutes might face when returning from exploration missions. Orion will be the most advanced spacecraft ever designed and carry astronauts farther into space than ever before. It will provide emergency abort capability, sustain astronauts during space travel and provide safe re-entry from deep space. During the test, a C-130 airplane dropped a dart-shaped test vehicle with a simulated Orion parachute compartment from an altitude of 25,000 feet. Orion's drogue chutes were deployed at approximately 20,000 feet, followed by small pilot chutes, which then deployed the three main parachutes. Each of the main parachutes is 116 feet wide and weighs more than 300 pounds. "Each one of these tests helps us verify the parachute system for Orion is safe, efficient and robust," said Chris Johnson, a NASA project manager for Orion's parachute assembly system. "Today's test demonstrated the parachutes can deploy at the maximum velocity expected when returning from deep space." This is the latest in a series of parachute drop tests, with each one designed to test a different condition or behavior of the parachutes. Besides the dart-shaped test vehicle used to simulate the speeds at which Orion will descend, NASA also uses a test vehicle that more closely resembles the actual Orion spacecraft. Orion will fly its first test flight, Exploration Flight Test 1, in 2014. During the test, the spacecraft will travel more than 3,600 miles into space — 15 times farther from Earth than the International Space Station — and reach speeds of more than 20,000 mph before returning to Earth. This unmanned test flight will launch from Cape Canaveral Air Force Station in Florida. It is designed to test several Orion systems, including the heat shield and parachutes at speeds generated during a return from deep space. In 2017, Orion will be launched by NASA's Space Launch System (SLS), a heavy-lift rocket that will provide an entirely new capability for human exploration beyond low Earth orbit. Designed to be flexible for launching spacecraft for crew and cargo missions, SLS will enable new missions of exploration and expand human presence across the solar system. NASA completed the latest in a series of parachute tests for its Orion spacecraft Thursday at the U.S. Army Yuma Proving Ground in southwestern Arizona, marking another step toward a first flight test in 2014. The test verified Orion can land safely even if one of its two drogue parachutes does not open during descent. Orion will take humans farther into space than ever before, but one of the most challenging things the multipurpose vehicle will do is bring its crew home safely. Because it will return from greater distances, Orion will reenter the Earth's atmosphere at speeds of more than 20,000 mph. After re-entry, the parachutes are all that will lower the capsule carrying astronauts back to Earth. "The mockup vehicle landed safely in the desert and everything went as planned," said Chris Johnson, a NASA project manager for Orion's parachute assembly system. "We designed the parachute system so nothing will go wrong, but plan and test as though something will so we can make sure Orion is the safest vehicle ever to take humans to space." Orion uses five parachutes. Three are main parachutes measuring 116 feet wide and two are drogue parachutes measuring 23 feet wide. The 21,000-pound capsule needs only two main parachutes and one drogue. The extra two provide a backup in case one of the primary parachutes fails. To verify Orion could land safely with only one drogue parachute, engineers dropped a spacecraft mockup from a plane 25,000 feet above the Arizona desert and simulated a failure of one of the drogues. About 30 seconds into the mockup's fall, the second drogue parachute opened and slowed the mockup down enough for the three main parachutes to take over the descent. The next Orion parachute test is scheduled for February and will simulate a failure of one of the three main parachutes. NASA engineers have demonstrated the agency's Orion spacecraft can land safely if one of its three main parachutes fails to inflate during deployment. 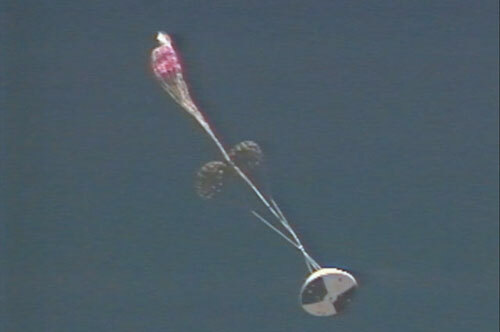 The test was conducted Tuesday in Yuma, Ariz., with the parachutes attached to a test article. Engineers rigged the parachutes so only two would inflate, leaving the third to flag behind, when the test capsule was dropped from a plane 25,000 feet above the Arizona desert. "Today is a great validation of the parachute system," said Chris Johnson, a NASA project manager for Orion's parachute system. "We never intend to have a parachute fail, but we've proven that if we do, the system is robust for our crew to make it to the ground safely." Orion's parachutes will perform in ways no landing system for a spacecraft carrying humans has been required to do before. Because Orion will return to Earth from greater distances, it will reenter Earth's atmosphere at speeds of more than 20,000 mph. After re-entry, astronauts will rely on the parachutes to slow the spacecraft for a gentle splashdown in the Pacific Ocean. This 21,000-pound capsule needs only two main parachutes and one drogue parachute. But NASA spacecraft, particularly those carrying humans, are designed to keep working when something goes wrong. So, Orion will be equipped with three main parachutes and two drogues, providing each system one backup parachute. In December, engineers simulated a failure of one of the drogue parachutes in a test that ended with a safe landing, proving the system design is valid. 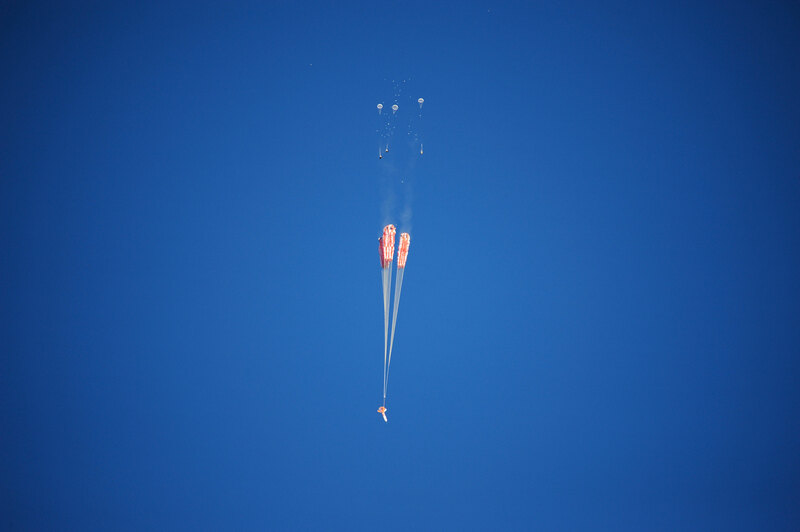 Tuesday's test was the eighth parachute engineering development drop test. The next is scheduled for May. 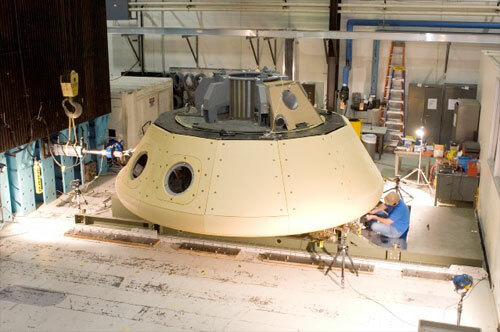 The system also will be put to the test in 2014 when Orion makes its first flight test. During the mission, an uncrewed capsule will travel 3,600 miles from Earth, farther than any spacecraft designed to carry humans has gone in more than 40 years. A test version of NASA's Orion spacecraft safely landed during a simulation of two types of parachute failures Wednesday. In the test, conducted in Yuma, Ariz., the mock capsule was traveling about 250 mph when the parachutes were deployed. That is the highest speed the craft has experienced as part of the test series designed to certify Orion's parachute system for carrying humans. Engineers rigged one of the test capsule's two drogue parachutes not to deploy and one of its three main parachutes to skip its first stage of inflation after being extracted from a plane 25,000 feet above the Arizona desert. 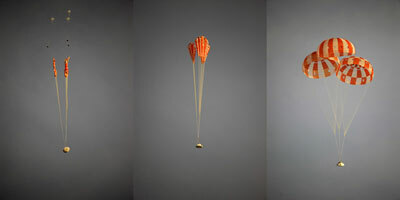 Drogue parachutes are used to slow and reorient Orion while the main parachutes inflate in three stages to gradually slow the capsule further as it descends. The failure scenario, one of the most difficult simulated so far, will provide data engineers need for human rating the parachute system. "The tests continue to become more challenging, and the parachute system is proving the design's redundancy and reliability," said Chris Johnson, NASA's project manager for the Orion parachute assembly system. "Testing helps us gain confidence and balance risk to ensure the safety of our crew." Orion has the largest parachute system ever built for a human-rated spacecraft. The canopies of the three main parachutes can cover almost an entire football field. After reentering Earth's atmosphere, astronauts will use the parachutes to slow the spacecraft for a splashdown in the Pacific Ocean. Testing irregularities allows engineers to verify the parachutes are reliable even when something goes wrong. The tests provide information to refine models used to build the system and Orion. Changes to the design and materials used in Orion's parachute system already have been made based on previous tests. Other government or commercial spacecraft using a similar parachute system also can benefit from the work done to validate Orion. "Parachute deployment is inherently chaotic and not easily predictable," said Stu McClung, Orion's landing and recovery system manager. "Gravity never takes any time off -- there's no timeout. The end result can be very unforgiving. That's why we test. If we have problems with the system, we want to know about them now." Orion's next Earth-based parachute test is scheduled for July, when the test capsule will be released from 35,000 feet, a higher altitude than ever before. The first test of the parachutes after traveling in space will be during Exploration Flight Test-1 in 2014, when an uncrewed Orion will be return from 3,600 miles above Earth's surface. The spacecraft will be traveling at about 340 mph when the parachutes deploy. A complicated, high-altitude test Wednesday demonstrated NASA's new Orion spacecraft could land safely even if one of its parachutes failed. The 10th in a series of evaluations to check out the Orion multipurpose crew vehicle's parachute system dropped the test capsule from a C-17 aircraft at its highest altitude yet, 35,000 feet above the Arizona desert. One of three massive main parachutes was cut away early on purpose, leaving the spacecraft to land with only two. The test at the U.S. Army's Yuma Proving Ground was the highest-altitude test of a human spacecraft parachute since NASA's Apollo Program. During previous tests, a mock capsule was dropped from a height of 25,000 feet and the parachutes deployed at no higher than 22,000 feet. The extra 10,000 feet of altitude at the beginning of Wednesday's test made the demonstration the best so far of Orion's parachute flight and landing. "The closer we can get to actual flight conditions, the more confidence we gain in the system," said Chris Johnson, project manager for the Orion capsule parachute assembly system at NASA's Johnson Space Center in Houston. "What we saw today — other than the failures we put in on purpose — is very similar to what Orion will look like coming back during Exploration Flight Test-1's Earth entry next year." During its return from space, Orion's parachute system will begin to deploy 25,000 feet above the ground. Engineers gathered data on the effects of losing a parachute during the descent. The team already proved Orion can land with just two of its three main parachutes, but this was the first opportunity to study how one parachute pulling away in mid-flight might affect the remaining two. "We wanted to know what would happen if a cable got hooked around a sharp edge and snapped off when the parachutes deployed," said Stu McClung, Orion's landing and recovery system manager at Johnson. "We don't think that would ever happen, but if it did, would it cause other failures? We want to know everything that could possibly go wrong, so that we can fix it before it does." 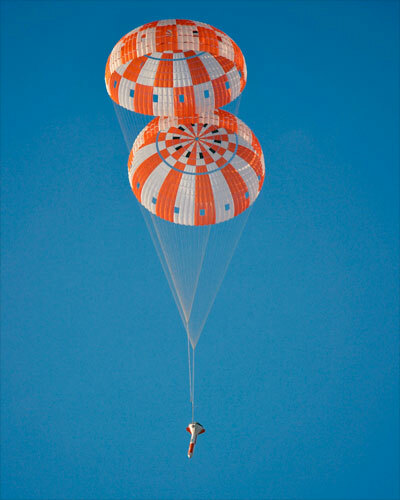 The test was part of a series of parachute tests that will enable NASA to certify Orion to carry humans into space. The system already has met the necessary requirements for Orion's first mission, Exploration Flight Test-1 (EFT-1), in September 2014. During that flight, Orion will travel 3,600 miles into orbit then return to Earth at speeds as fast as 20,000 mph, putting the parachute system to the test again as it lands in the Pacific Ocean. Engineers testing the parachute system for NASA's Orion spacecraft increased the complexity of their tests Thursday, Jan. 16, adding the jettison of hardware designed to keep the capsule safe during flight. The test was the first to give engineers in-air data on the performance of the system that jettisons Orion's forward bay cover. The cover is a shell that fits over Orion's crew module to protect the spacecraft during launch, orbital flight and re-entry into Earth's atmosphere. When Orion returns from space, the cover must come off before the spacecraft's parachutes can deploy. It must be jettisoned high above the ground in order for the parachutes to unfurl. "This was a tough one," said Mark Geyer, Orion program manager. "We'd done our homework, of course, but there were elements here that could only be tested in the air, with the entire system working together. It's one of the most complicated tests that we'll do, so we were all excited to see it work just as it was meant to." Previous parachute tests at the U.S. Army's Yuma Proving Grounds in Arizona tested the performance of the parachutes in various conditions without a forward bay cover. Adding the cover and its jettison, along with the deployment of three additional parachutes to pull the cover away from the crew module and lower it to the ground, added a level of complexity to the testing. "The parachute deployment and forward bay cover jettisons are two of the most difficult things for us to model on computers," said Chris Johnson, project manager for the parachutes. "That's why we test them so extensively. These systems have to work for Orion to make it safely to the ground, and every bit of data we can gather in tests like these helps us improve our models and gives us more confidence that when we do it for real, we can count on them." The forward bay cover is jettisoned using a thruster separation system built by Systima Technologies Inc. of Bothell, Wash. Lockheed Martin, prime contractor for Orion, tested the system for the first time on the ground in December. Two more ground tests will simulate different types of stresses on the cover, such as a potential parachute failure or loads on the spacecraft. NASA also plans a second airborne test with the forward bay cover to evaluate its performance with a failed parachute. NASA completed the most complex and flight-like test of the parachute system for the agency's Orion spacecraft on Wednesday. A test version of Orion touched down safely in the Arizona desert after being pulled out of a C-17 aircraft, 35,000 feet above the U.S. Army's Yuma Proving Ground. It was the first time some parachutes in the system had been tested at such a high altitude. Engineers also put additional stresses on the parachutes by allowing the test version of Orion to free fall for 10 seconds, which increased the vehicle's speed and aerodynamic pressure. "We've put the parachutes through their paces in ground and airdrop testing in just about every conceivable way before we begin sending them into space on Exploration Flight Test (EFT)-1 before the year's done," said Orion Program Manager Mark Geyer. "The series of tests has proven the system and will help ensure crew and mission safety for our astronauts in the future." After Orion's free fall, its forward bay cover parachutes deployed, pulling away the spacecraft's forward bay cover, which is critical to the rest of the system performing as needed. The forward bay cover is a protective shell that stays on the spacecraft until it has reentered Earth's atmosphere. The parachutes that slow Orion to a safe landing speed are located under the cover, so the cover must be jettisoned before they can be unfurled. The test also marked the last time the entire parachute sequence will be tested before Orion launches into space in December on its first space flight test, EFT-1. During the flight, an uncrewed Orion will travel 3,600 miles into space, farther than any spacecraft built to carry humans has been in more than 40 years. Orion will travel at the speed necessary to test many of the systems critical to NASA's ability to bring astronauts home safely from missions to deep space, including an asteroid and eventually Mars. Orion's next parachute test is set for August and will test the combined failure of one drogue parachute and one main parachute, as well as new parachute design features. It is one of three remaining tests needed to demonstrate the system's capability for human missions, but does not need to be completed before Orion's first flight later this year. A dart-shaped test vehicle descended from the skies above the Arizona desert under Orion's parachutes Wednesday, Jan. 13, successfully completing the final development test of the parachute system. NASA engineers evaluated modifications to the system for the last time before the start of qualification testing for Orion missions with astronauts. Above: Orion's three main parachutes begin to unfurl after they are drawn out by three pilot parachutes. A test of the spacecraft's parachute system was conducted Jan. 13. During the test, engineers demonstrated that when the spacecraft is traveling faster than planned during the descent, Orion's parachutes can properly deploy and withstand high-inflation loads. 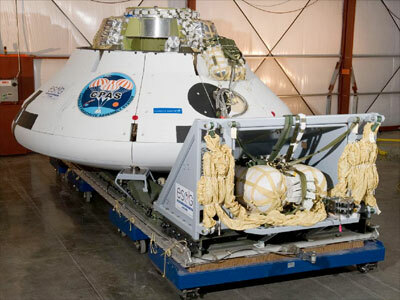 The dart-shaped vehicle allows engineers to simulate faster descent conditions than the capsule-shaped test article that has been used in many previous evaluations. The test also evaluated new, lighter-weight suspension line material for the parachutes saving a significant amount of mass. "The completion of this last development test of the parachute system gives us a high degree of confidence that we'll be successful in certifying the system with the remaining qualification tests for flights with astronauts," said CJ Johnson, project manager for Orion's parachute system. "During our development series, we've tested all kinds of failure scenarios and extreme descent conditions to refine the design and ensure Orion's parachutes will work in a variety of circumstances. We'll verify the system is sound during our qualification tests." During Wednesday's test, a C-17 aircraft dropped the test vehicle from its cargo bay while flying 30,000 feet over the U.S. Army Yuma Proving Ground in Yuma, Arizona. NASA conducts the tests at the proving ground because of the proven capabilities of airdrop testing that exists there, and the ability for engineers to gather detailed video and photo imagery from chase aircraft to analyze how all of the parachute system's mechanisms work, including how mortars fire and the parachutes unfurl and descend. Orion's parachute system is a critical part of returning future crews who will travel to deep space on the journey to Mars and return to Earth in the spacecraft. The first parachutes deploy when the crew module is traveling more than 300 mph, and in a matter of minutes, the remaining parachute system slows the vehicle and enables it to splash down in the ocean at about 20 mph. The system is composed of 11 total parachutes that deploy in a precise sequence. Three parachutes pull off Orion's forward bay cover, which protects the top of the crew module — where the packed parachutes reside — from the heat of reentry through Earth's atmosphere. Two drogues then deploy to slow the capsule and steady it. Three pilot parachutes then pull out the three orange and white mains, on which Orion rides for the final 8,000 feet of its descent. Orion's main parachutes are packed to the density of oak wood to fit in the top part of the spacecraft, but once fully inflated cover almost an entire football field. The test was the seventh in the developmental series. In July, engineers will begin qualifying Orion's parachute system for flights with astronauts. The series will encompass eight drop tests over a three year-period. Engineers successfully tested the parachutes for NASA's Orion spacecraft at the U.S. Army Yuma Proving Ground in Arizona Wednesday, March 8. This was the second test in a series of eight that will certify Orion's parachutes for human spaceflight. The test, which dropped an Orion engineering model from a C-17 aircraft at 25,000 feet, simulated the descent astronauts might experience if they have to abort a mission after liftoff. Eight years between the start of Project Apollo and Apollo 11 yet it takes 11 years just to develop/qualify the Orion's parachute system. What's wrong with this picture? According to NASA spokeswoman Barbara Zelon, the contract for the development and certification of the Orion parachute system has been in place for 11 years. This included early concept and trade studies, numerous ground-based tests, and 17 full-scale development airdrop tests required to prove out a wide range of failure scenarios. Finally, Orion has completed three of the final eight human certification airdrop tests and plans to complete human certification in early 2019. So Jacobs is likely to have a parachute development contract for at least 13 years. It certainly is a reflection of the budget and how the nation feels about space exploration and not on the people making the chutes or doing the testing. NASA has completed the final test to qualify Orion's parachute system for flights with astronauts, checking off an important milestone on the path to send humans on missions to the Moon and beyond. Above: An Orion test capsule with its three main parachutes touches down in the Arizona desert Sept. 12. Over the course of eight tests at the U.S. Army's Yuma Proving Ground in Arizona, engineers have evaluated the performance of Orion's parachute system during normal landing sequences as well as several failure scenarios and a variety of potential aerodynamic conditions to ensure astronauts can return safely from deep space missions. "We're working incredibly hard not only to make sure Orion's ready to take our astronauts farther than we've been before, but to make sure they come home safely," said Orion Program Manager Mark Kirasich. "The parachute system is complex, and evaluating the parachutes repeatedly through our test series gives us confidence that we'll be ready for any kind of landing day situation." The system has 11 parachutes, a series of cannon-like mortars, pyrotechnic bolt cutters, and more than 30 miles of Kevlar lines attaching the top of the spacecraft to the 36,000 square feet of parachute canopy material. In about 10 minutes of descent through Earth's atmosphere, everything must deploy in precise sequence to slow Orion and its crew from about 300 mph to a relatively gentle 20 mph for splashdown in the Pacific Ocean. The parachute system is the only system that must assemble itself in mid-air and must be able to keep the crew safe in several failure scenarios, such as mortar failures that prevent a single parachute type to deploy, or conditions that cause some of the parachute textile components to fail. Above: The evaluation was the final test to qualify Orion’s parachute system for flights with astronauts. During the final test, which took place Sept. 12, a mock Orion was pulled out from the cargo bay of a C-17 aircraft flying higher than 6.5 miles. The protective ring around the top of Orion that covers the parachute system was jettisoned and pulled away by the first set of Orion's parachutes, then the remaining parachutes were deployed in precise sequence. Additionally, Orion parachute engineers have also provided considerable insight and data to NASA's Commercial Crew Program partners. The knowledge gained through the Orion program has enabled NASA to mature computer modeling of how the system works in various scenarios and help partner companies understand certain elements of parachute systems. In some cases, NASA's work has provided enough information for the partners to reduce the need for some developmental parachute tests, and the associated expenses. Orion will first fly with astronauts aboard during Exploration Mission-2, a mission that will venture near the Moon and farther from Earth than ever before, launching atop NASA's Space Launch System rocket—which will be the world's most powerful rocket. The parachutes for Orion's upcoming uncrewed flight test, Exploration Mission-1, already are installed on the vehicle at Kennedy Space Center in Florida. Copyright 2018 collectSPACE.com All rights reserved.